Mukuni Village of the Leya tribe is almost 700 years old. The communal gathering point for this village of 7,000 people is a huge tree (Ngnombe Ilede which means sleeping cow because of the shape of the trunk of the tree) right in the center of the village, this is the village place to talk and socialize. Mukuni was founded by a female landowner in the 15th century who, though she made her husband chief, retained ownership of all the land. From that time forward there have always been two chiefs, male and female and always related…brother and sister or uncle and niece, etc. 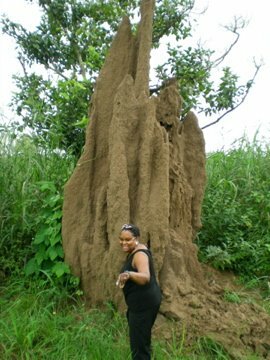 The land is pockmarked with termite mounds…some of which are as high as 6 feet and 3-4 feet wide. 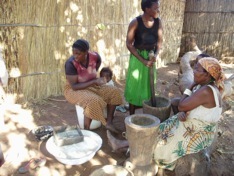 We had a chance to see the women making the local beer – which we declined to sample! And we also declined to buy some FOR the men and women sitting around waiting…they drink in separate groups. Mukuni even has its own jail…a tiny little building that faces the town square so everyone can see the inhabitant. The red, clay dirt is so thick you feel like you are dragging in it. It makes you wonder what they do if their children get asthma. 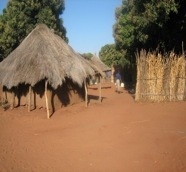 All the villagers are Christians and there are seven churches in the village. within the family enclosure for the parents, female children and male children. [Parents should contain their jealousy!] The father of this family was at one time a porter for a former hotel and as such his house contained a television and a radio. There’s no electrical power in the village so they use solar power whenever possible. Even if the government were able to run electrical wires to all the villages, we’re told it would cost the village upwards of $200 USD a month to maintain. This cost is practically insurmountable where $1 usd = 4,500 Kwachas, $100 = K450, 000 and $200 = K1 mil and the average person with a teaching job may only earn about K250, 000 a year or about $60. As usual, whenever there’s more than two people present a favorite topic is politics. 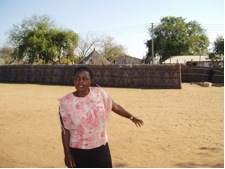 Right now the political gossip in Mukuni Village centers around local dissatisfaction with the male chief. He’s been Chief for 18 years but it has come to their attention that he is making good money off the tourist revenue [fees are paid for tours] but he is not sharing it with the village. Now he’s been away for a month, afraid to return home because he might be poisoned! To add to the shame of his actions of late, it was discovered that the Chief went to meet the President of Zambia at the airport which is contrary to the traditions of the President being responsible to meeting each Chief in their village. This act brought dishonor upon the village. It is considered a serious scandal of major proportions. Life is only relevant to the current situation. Posted on August 8, 2005, in Home Page. Bookmark the permalink. 2 Comments. Thanks for catching the misspelling!